Ransom Marlow was born December 04 1801 NC and died June 07 1886 Jackson Co GA. He married Delila Wilson January 25 1821 Jackson Co GA. Ransom and Delila are buried in the Marlow Family Cemetery in Pendergrass GA.
Josiah/Joseph M Marlow was born Abt 1822 and married Nancy A Rebecca Bradley 30 Nov 1847. James L Marlow was born April 1822 died May 30 1875 and married Lucy A Smith January 30 1847. John W Marlow was born March 13 1826 in Jackson Co GA and died February 07 1885 in Jackson Co GA. He married Elizabeth S Pierce August 11 1868 in Jackson Co GA. Ransom A Marlow was born 1845 died April 1863 and married Rebecca A Dean October 03 1852. He is buried in Lauderdale Springs Confederate Cemetery, Lauderdale MS. A new marker was placed in the cemetery 01 February 2003. Francis W Marlow was born October 08 1842 died September 17 1913 and married Tilitha Kemp. Franklin J Marlow was born Abt 1850 in Jackson Co GA and married Martha A.
Jasper B Marlow was born Abt 1854 in Jackson Co GA. He married Sophiral. Wood Lee Marlow was born September 18 1857 died December 03 1932 and married Lovie B.
William J Marlow was born Abt 1850 married Mellerd L.
Franklin F Marlow was born May 1850 and married Martha. 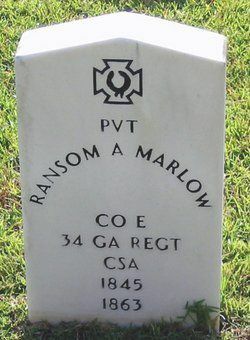 Ransom C Marlow was b. Jan 29 1851 d. Jan 09 1925 married 1877 Martha Frances Morris. Martha was b. Jan 26 1862 d. August 23 1959. James L Marlow was born December 1861 in Jackson Co GA and married Avis Marsh Abt 1884. David J Marlow was born Aug 1873 in Jackson Co GA. He married Emmie Abt 1896. George W Marlow was born Nov 1859 in Jackson Co GA. 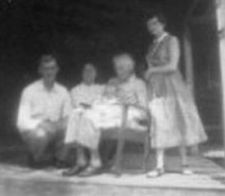 He married Martha S.
Nancy J Marlow was born Oct 17 1876 died Dec 15 1962 AL and married Mark Anthony AFT 1901. Charlie Marlow was born May 1885 died 1966 and married Donnie May Simms.